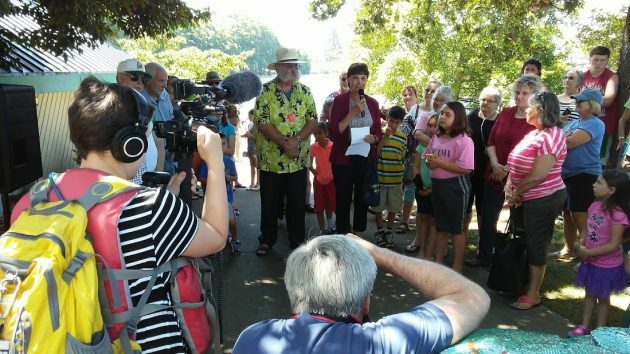 That was quite a celebration, the launching Thursday of Albany’s Waverly Duck in the pond for which it was named. My guess is that maybe 200 people, many of them kids, showed up. 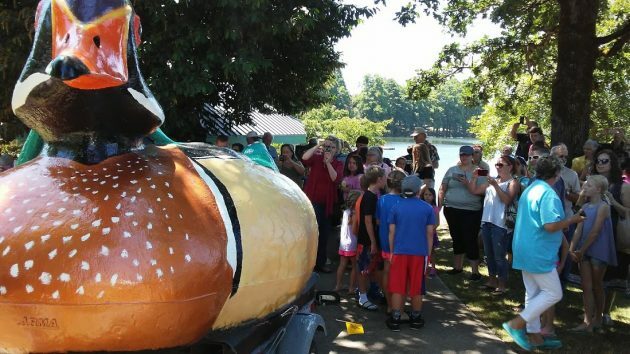 Half the city government was on hand, and Mayor Sharon Konopa was in her element, praising the duck as a piece of beautiful art and thanking everybody who had a hand in donating, funding, restoring, painting and finally towing this foam and fiberglass replica of a wood duck back to Waverly Lake. The duck and its background have been the subjects on this site from time to time since last winter, when the mayor first got the city council’s consent to accept the old and deteriorated duck as a gift. The story is told in detail in a city of Albany press statement you can read here. Mayor Sharon Konopa speaks at the launching. 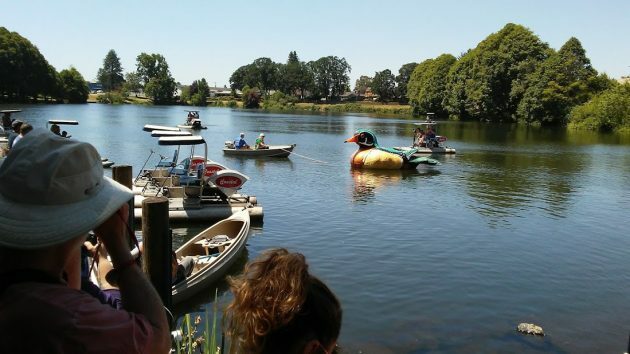 Councilman Ray Kopczynski, at her side, raised the money for the duck’s restoration. The duck has been unveiled. Did any wood duck ever look this splendid? And away she floats. Well, away to a buoy in the middle of Waverly Lake, where people can see the duck all summer long. Thank you, Hasso, for your coverage of this event. Just one question. Did City Councilor Rich Kellum demand that the duck report on what it sees to the Council. No doubt the duck will witness many acts too sensitive for the council to hear about cold. The Council will need plenty of time to consider in a thoughtful manner. We bow low. We are all in service to the Mighty Council. All hail the chief.